Language arts education in the primary grades provides students a foundation for lifelong learning. Literacy creates the foundation for a lifetime and allows a wide range of opportunities. Elementary school literacy involves developing oral and written communication in all subject areas. Primary students learn literacy skills through instruction and practice of speaking, reading, writing and listening; teachers help students master these literacy skills according to benchmarks established by state and federal education standards. Reading at the primary level involves learning the basic skills to understand words and their meanings. Reading literacy includes phonemics, recognition of the basic sound units that make up words. Basic reading skills also require knowledge of vocabulary, fluency and comprehension. Students must also understand how to use phonics, the process of matching letters with sounds. Students in advanced grades work on higher development and sophistication of these decoding strategies, but primary school provides the foundation for reading. Elementary educators assess students at this level to identify potential reading problems, including memory processing and eyesight, so they can be treated. Primary schools teach the foundation for written language. 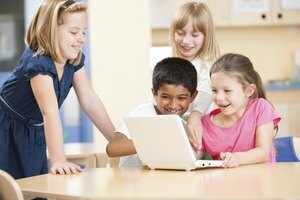 The focus on physical writing skills in some states, however, abandons teaching cursive in favor of instructing students in basic typing and keyboarding skills necessary to use computers. Elementary-level writing skills still include the ability to identify and write letters and words and convey thoughts using accepted formats, including grammar conventions. Primary teachers also help students develop a writing vocabulary and learn to use words in different kinds of narratives. 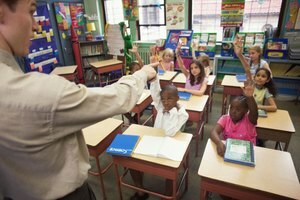 Elementary teachers instruct students in basic speaking skills, and some offer district curriculum about listening skills; this curriculum asks students to listen critically and present basic oral presentations during class. 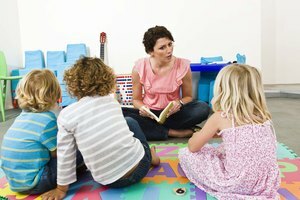 Primary schools also work with specialists, including speech-language pathologists, to identify and treat children with communication disorders, such as hearing loss. Primary school curriculum standards list benchmarks for student mastery, but these may be recommendations rather than requirements since many school districts promote students automatically in the primary grades. These achievement benchmarks appear in standards passed by state departments of education. They list objectives for each primary grade in literacy areas, including reading, writing and speaking. Some state education guidelines also list objectives specifically for listening. The changing student populations in American schools present challenges for teaching literacy at the elementary level. Los Angeles Unified School District, for example, has a primary student population speaking 92 languages in the home; one-third of this group is classified as English Learner, an identification showing less than fluent literacy skills. Educators debate the best approach for these primary students, with some districts offering instruction using bilingual and sheltered teaching techniques and other schools teaching in the child's home language. Grayson, Lee. "Literacy in Primary Schools." Synonym, https://classroom.synonym.com/literacy-primary-schools-6389.html. 26 September 2017.